In light of contemporary acts of violence conducted by Creech Air Force Base drone pilots, ongoing burial of nuclear waste at the NNSS, and the waste of tax dollars at the NNSS on pro-nuclear weapons work (in the form of subcritical nuclear detonations), the couple married on Friday the 18th are taking this step into marriage as a sign of personal power to bless the enemies of the USA, rather than curse them. Ming and River Victor are committed to nuclear weapons abolition, and the end of drone warfare, and a nuclear-free future. They recognize that the cards are stacked against such lofty goals of peace, environmental justice, and social justice, yet they will make vows to each other showing the world that individuals across the USA do indeed have the power to choose truth, trust, life, love and hope as the antedote to the horrors of nuclearism and militarism and drone terrorism. The nuclear abolitionists on the Sacred Peace Walk are united in opposition to the U.S. propaganda that causes ordinary civilians to choose falsehood, fear, hate, and the desperation of violence instead of choosing truth, trust, life, love, and hope. The positive choices represented in the day’s ceremonies at the NNSS are choices to which the Peace Walkers aspire. Forty people participated in this year’s Sacred Peace Walk from Las Vegas to the NNSS. Some of the wedding party was arrested on Wednesday, April 16 at Creech Air Force Base. The Walk included participants from as far away as the Netherlands. 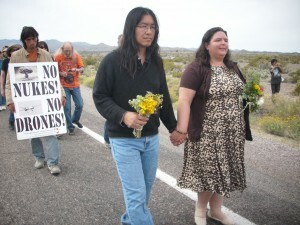 The newly married couple met three years ago on the Sacred Peace Walk.